Walsh, who had been missing for a month with a foot problem, scored a fantastic left-foot volley, much to the delight of his manager, John Robertson. The Highlanders’ joy contrasted with Partick Thistle’s woe as the 2-1 defeat left Gary Caldwell’s side stuck in second-bottom position. Robertson said: “I’m delighted for Tom as he had been on fire before his injury and it’s a big win for us. “We’ve got five massive matches coming up before the Scottish Cup semi-final [against Hearts] and it was important that we won tonight and then carry that into next week when we have three home games in seven days. We could make a real statement so it was important we won. Inverness had the better chances all night. 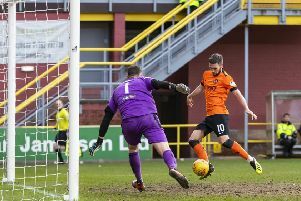 Partick’s regular goalkeeper Connor Hazard is on international duty with Northern Ireland but Jamie Sneddon proved he is a more than able deputy with two marvellous saves toward the end of the first half. Sean Welsh burst forward in 35 minutes and released Joe Chalmers, who had time to measure a shot from just outside the box but Sneddon brilliantly pushed it over the bar. Then, two minutes before half-time, he made an even better stop. Chalmers whipped in a free-kick and Jamie McCart made it his, powering a header down towards the right corner but Sneddon got a glove on it. The visitors went ahead on 65 minutes and it was a well-worked goal. Jordan White cleverly allowed Carl Tremarco’s ball forward to run through to Aaron Doran, who expertly shot past Sneddon. The lead lasted just three minutes as Partick produced a terrific goal of their own. Blair Spittal drove forward and picked out Scott McDonald in the box. The veteran striker cushioned the ball to Stuart Bannigan, who curled a left- foot shot into the left corner. However, Caley Thistle won it in 81 minutes and it was a super goal. Thistle did not deal with Liam Polworth’s ball forward, Aaron Doran cleverly flicked it on and Walsh, pictured, spun onto his left side to hammer a volley past Sneddon.